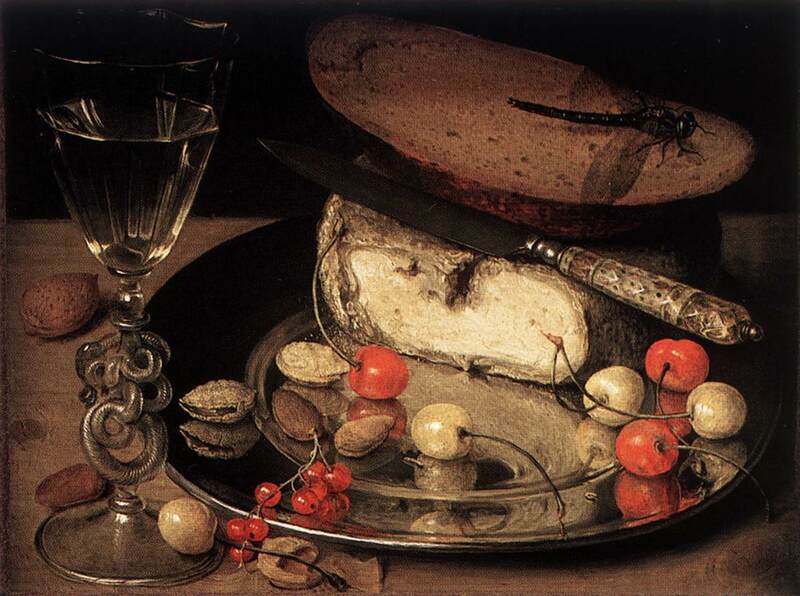 In my earlier posts on the wine related paintings of Georg Flegel I commented on a particularly beautiful serpentine wine glass in Still-Life with Cherries, 1635 and curly cane with stamped prunts wine glass in Still-Life with Stag Beetle, 1635. 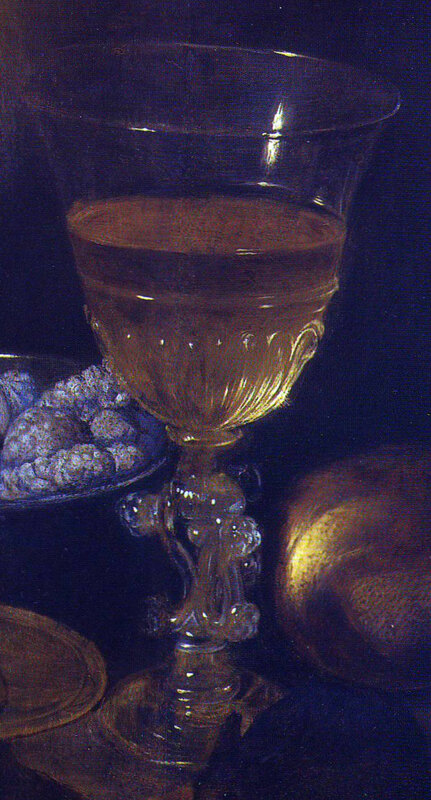 These paintings caught my attention because I had not yet come across this style of wine glass while researching for my Dutch series of posts. Georg Flegel produced over one hundred works of art. In reviewing approximately 40 paintings I have come across only two true serpentine glasses and two glasses with a stem of three or four curly canes adorned with stamped prunts. In addition to the two paintings described above a third painting features a serpentine glass, the undated Still-life with Strawberries on a Plate, see Christies, Lot 56, Sale 5944, 14 April 1998. A fourth painting features a curly cane stamped prunt, which is Kerzenstilleben (Candle still-life) 1636. The three dated glasses were painted in 1635 and 1636. Several other paintings from the same period feature facon de Venise glasses but these have bulbous stems to which curved canes are symmetrically attached thus forming wings. I have excluded them because the canes attach to the stem and do not form the stem itself. I should remark that a rather curious wine glass appeared in Tabakstilleben mit Kerze, 1636. The bowl is attached to a hollow toroid, adorned with two, winged curly canes with stamped prunts, the bottom of which is attached to a stem. There must be hole connecting the bowl and toroid for it appears to contain the same yellow wine! 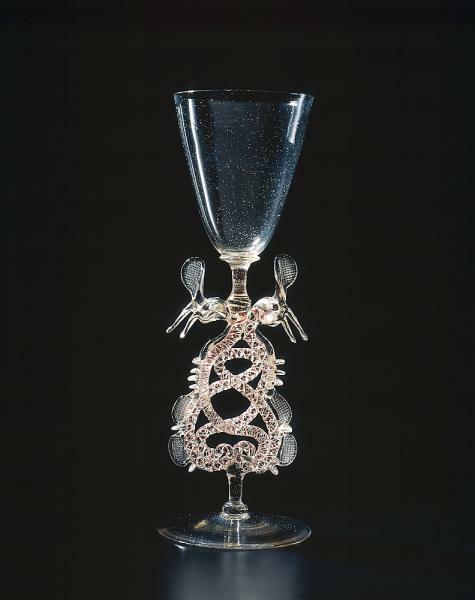 I quickly became curious about the appearance of four of these five elaborate wine glasses in the years 1635 and 1636. Why do they appear in such a short time span? Where did they come from? What is the history behind the two serpentine wine glasses? This style of wine glass originated with the Venetians who remained masters at producing them from the 15th through the 17th centuries. Having first produced a colorless glass known as Cristallo the Venetian glass makers went on to gild the glasses, apply molds for decoration, apply canes, engrave them with diamond-points, and finally assemble a single glass made from these various components. These luxurious glasses were in demand all over Europe. The Venetians were so successful at controlling the knowledge required to produce these glasses that glass factories were created throughout Europe in an attempt to recreate these glasses. These imitation glasses are known as facon de Venise. One trait of Venetian glass is the use of canes. Canes are rods of glass which have color in them. Opaque white canes were particularly popular. Known as vetro a filigrana there were three categories: vetro a fili (glass with threads), vetro a retorti (glass with twisted threads), and vetro a reticello (glass with a small network). In the late 16th century canes were used to produce elaborate glasses which were both symmetrical with wings and jaws (dragon-stem) or even clearly serpentine. Known as vetri ai serpenti they became a popular Venetian export and were extensively produced in German and Netherlandish glass factories. These intricate glasses were collected and given as gifts, often being stored in a cabinet. Georg Flegel moved to Vienna in 1580 and it is here that I initially thought he might have purchased or received these glasses. It was not uncommon for Baroque painters to include older objects in their painting and certainly not for Georg Flegel. The Bartmann jug depicted in two of his paintings would have been approximately 100 years old at the time of painting. Therefore it is reasonable that he might not paint glasses he obtained in Vienna until some 50 years later. The Archduke Ferdinand II of Austria collected Venetian glass and in his Kunstkammer (cabinet of curiosities) he had an entire cabinet dedicated to glasses. Not only did he purchase glass from the nearby factory in Hall but he installed a glass making workshop in his imperial court at Innsbruck. The later is quite fascinating, Archduke Ferdinand became increasingly frustrated with the quality of glass coming from the factory in Hall. He negotiated with the Venetian ambassador for a temporary loan of Venetian glass makers who would make glass for his court and not for commercial use. The use of soda ash and some necessary tools required for such quality work had to be negotiated with the Venetian government. The workshop was productive from 1570 to 1591. During this time the first glass makers received salary, room, and board but this was changed to remove the salary and allow the glass makers to sell glass made during their own time. At a cursory level it is reasonable to assume these glasses might have been available for purchase during Georg Flegel’s residency. 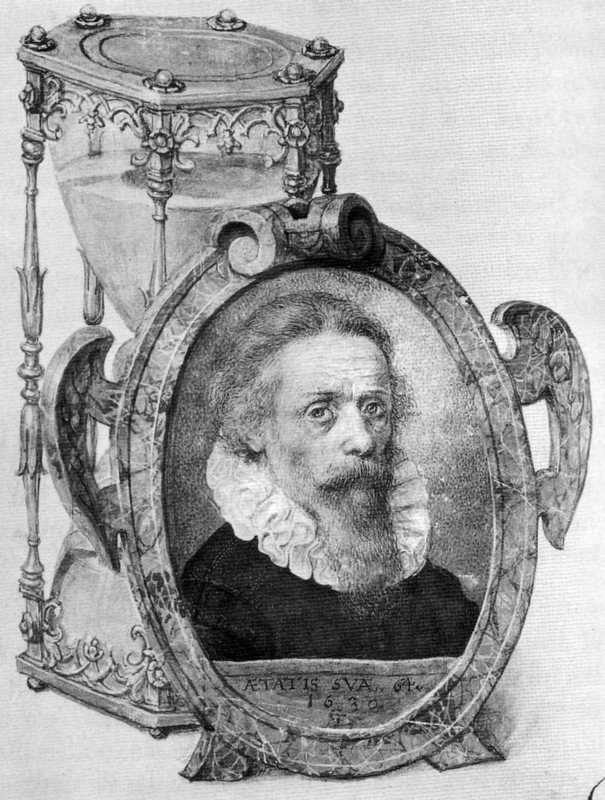 Georg Flegel moved to Frankfurt in 1593 when the Counter-Reformation began to take effect. 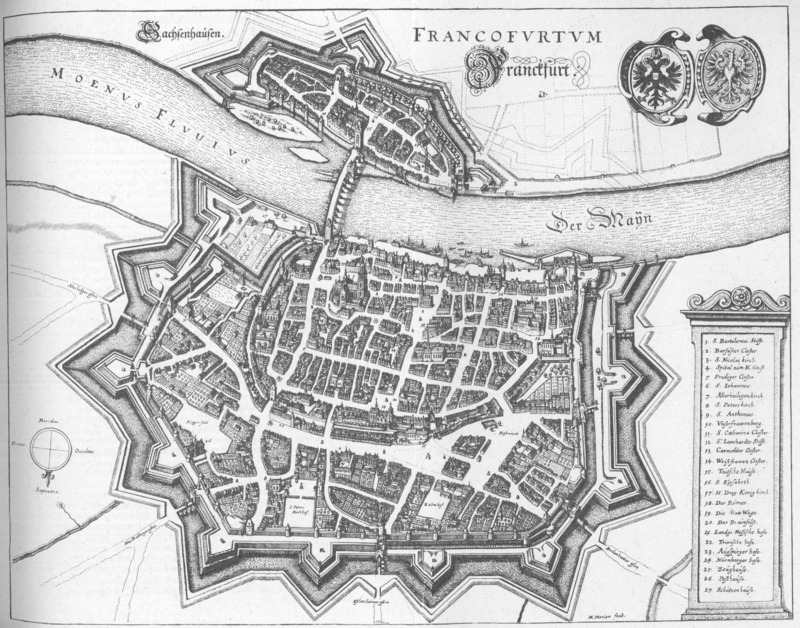 Though Germany became caught up in The Thirty Years’ War (1618-1648) there was initially a minimal effect in Frankfurt. It is possible that he acquired these glasses in Frankfurt. German glass factories produced facon de Venise and might have had the technical capabilities to produce serpentine glasses in the 1630s. 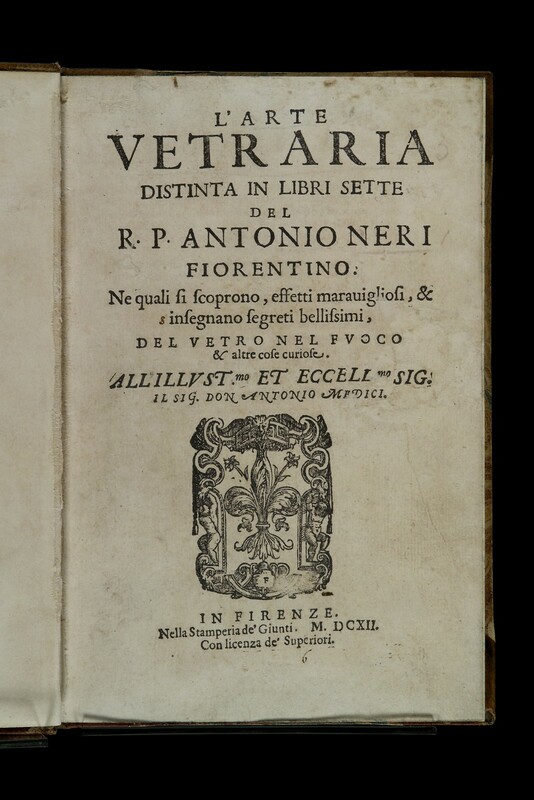 For in 1612 Antonio Neri, who was a citizen of Florence and a glass maker, published the famous book L’arte vertraria (The art of glass). This book describes the entire body of Italian glassmaking knowledge and was one key factor in the decline of the Venetian monopoly on high quality glassware. Two decades later the plague devastates Venice in 1630-1631 killing off large numbers of master glass makers and scattering others. Though the government authorized all members of the Venetian mainland to apprentice at the guilds, the glass makers were exempt. The reduced Venetian exports combined with the increase of glassmaking factories in Bohemia, England, and France shifted the demand to local facon de Venise. Swedish troops marched into Frankfurt in 1631 where they were garrisoned for several years. In 1635 the plague arrived at Frankfurt killing thousands over two years including a fair number of troops. Such was the concern for the plague that the annual book fair was cancelled for 1635. It is during these plague years that the datable serpentine wine glass and other intricate glasses appear in Georg Flegel’s paintings. In fact the Bartmann jug also appears in Still-life with Stag Beetle, 1635. The same jug appears in the Metropolitan Museum’s undated Still-Life. Under Provenance it is noted, “Wolfgang J. Müller. Letter to Margaretta Salinger. January 26, 1949, dates it ‘with some certainty’ to about 1630.” Could it be that Georg Flegel purchased these facon de Venise glasses during the plague years, perhaps from the sale of a devastated family’s goods? Perhaps the presence of the Bartmann jug isn’t just an example of “prolonged ‘active life'” as described by David Gaimster in “German stoneware, 1200-1900” but a reminiscence of Frankfurt before the plague and Swedish occupation? I shall pursue this mystery further in a subsequent post. Campbell, Gordon. The Grove Encyclopedia of Decorative Arts, Volume 2. Oxford University Press, 2006. Edwards, Geoffrey. Art of Glass: Glass in the Collection of the National Gallery of Victoria. Macmillan, 1998. Lanaro, Paolo. At The Centre of the Old World. Centre for Reformation and Renaissance Studies, 2006. Page, Jutta-Annette and Domenech, I. Beyond Venice: Glass in Venetian Style, 1500-1750. Hudson Hills Press, 2004. Weidhaas, Peter, Gossage, C., and Wright, W. A History of the Frankfurt Book Fair. Dondurn, 2007. Great post! Those glasses are awesome! Thank you for sharing! ~ Oh God, My Wife Is German. Yes, pretty amazing stuff! Thanks for the comment and follow!